The Paraben Free Princess: Spell Cosmetics - Big Sale Tomorrow! Starting Wednesday, Spell Cosmetics is offering 40% off orders over $25 with FREE shipping. That's HUGE! The special code is 'Holiday'. 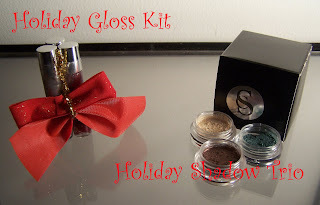 Its the Spell Cosmetics Holiday Sale!! No more waiting until Cyber Monday or Standing in line the day after Thanksgiving. Starting tomorrow (Wednesday), the Spell Sale starts! 40% off Storewide on all orders of $25.00 or more, and even better if your order totals $20.00 when you checkout, then choose your gift!! You can choose from the "Holiday Gloss Trio" of Silver, Gold and Red--or-- The "Holiday Shadow Trio" of Gold, Deep Green and Holiday Red! The Spell sale this year will run through Monday and Yes! Free Shipping!